Sure, the COLA (Cost of Living Allowance) is outdated and inherently unfair to the AFL’s other seventeen clubs, but the League’s trade ban on the Swans is astounding. Sydney now find themselves in the same league as Essendon, Carlton, Adelaide and Melbourne. Each club sanctioned during the past few years for misdemeanours ranging from drug use, salary cap cheating, and tanking. Each club copping their fair whack in the form of hefty fines and draft bans. Now Sydney are being whacked with the AFL’s cane for…..wait for it……following the rules the AFL set out for them! 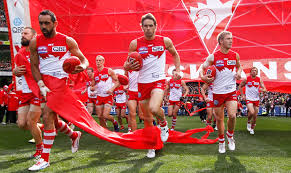 Swans CEO Andrew Ireland said it perfectly: “As you’d expect, the club is very disappointed and we don’t understand why the AFL has made this rule specifically for us considering we’ve complied with their rules,” Ireland said. Whether or not the COLA is a good or fair allowance is a different matter for discussion. What’s concerning here is the AFL not following due process and bringing the game into disrepute. It’s true, according to reports, that the Swans were informed about the phasing out of the COLA earlier this year, yet the subsequent trade bans associated with the ruling seem to have hit the club’s board for six. “For following the rules the Sydney Swans have been treated like Melbourne for tanking, Essendon for breaking the drug code and Adelaide for draft tampering. Exactly. While few clubs or supporters will grant the Swans sympathy, due to the unpopularity of the COLA, questions should be asked about the AFL’s methods here. Either the Swans have staged a very good media campaign to give the impression that they knew nothing of this ban prior to the last fortnight, or the AFL is acting like a bitter child after being blindsided by the Swans in last year’s Buddy Franklin deal. No sympathy. Imagine if they were involved in this year’s trade. Boyd would be a swan, as would Ryder. So Dave Hawthorn are allowed to keep getting topline players & winning Grand Finals whilst having gloating supporters & no-one blinks an eye but Swans are not granted the same courtesy for managing their team well. Hypocrisy.